On behalf of the staff of StarBase 118, we would like to congratulate Aron Kells on his recent promotion to the rank of Captain! Aron’s career started as a much different character, Airseé Lily Ventu. Tony, the writer behind both of these characters, started with Lily on the USS Victory as the ship’s Counselor. Ventu held this position up until the Victory was decommissioned and then transferred to the USS Constitution as Second Officer, on stardate 238403.29. 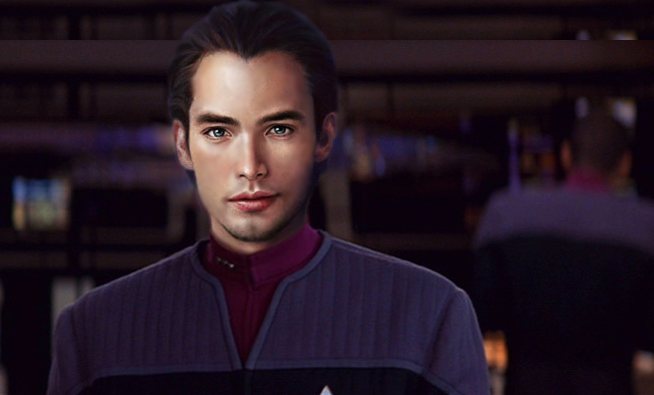 After a few months in that role, she then transferred to the USS Triumphant as the ship’s Executive Officer under Captain Rhys Bejain. When the Triumphant was decommissioned, she moved to the USS Independence as the Chief Medical Officer, and Counselor. Ventu remained on the Indy in this capacity until the USS Tiger launched under Fleet Captain Sidney Riley. Moving to the Tiger, Ventu once again assumed the role of Executive Officer on stardate 238505.05. Later that year, she transferred to StarBase 118 Ops as an Ambassador. She served in this role until she was promoted to the rank of Commander on stardate 238607.20. At that time, she was given command of StarBase 118 Ops. Ventu served in this role until her writer had to take a LOA from the fleet. Once the LOA was over, the character of Ventu was left as a diplomat aboard StarBase 118, and the writer behind her took Aron Kells for a test drive across the galaxy. Kells was posted as a Science Officer aboard the USS Drake, under Captain Quinn Reynolds. A year later, Commander Kells transferred to the role of Executive Officer aboard StarBase 118 Ops, under Captain Kalianna Nicholotti. He only got to serve in this role for a short time, as he was given command of the USS Mercury. With his Captaincy Exam behind him, Captain Aron Kells has elected to remain aboard the USS Mercury. He and his crew can be found among the stars trying to solve any scientific mystery that they come across. We wish Captain Kells and his crew continued success! For more on Captain Aron Kells and the crew of the Mercury, check out their wiki page or Yahoo Group page!